The Lady Rocks first defeated Hermann, 21-12, then knocked off undefeated Steelville in the semifinals, 20-13, to advance into the tournament championship game against a very talented Cuba team. New Haven lead by seven with three minutes to go before Cuba would battle back to tie the score at 22 with just under a minute to play. Then with under ten seconds remaining Brenna Langenberg dropped a 15 foot dagger with 6.5 seconds left on the clock to give New Haven a 24-22 lead, which would ultimately be the game winner. Following a Cuba timeout, they would have one last chance to force overtime, but New Haven’s defense stepped up and kept Cuba from getting a shot off before time expired as the Lady Shamrocks won in dramatic fashion, 24-22, and a first place finish in the St. Clair Tournament. 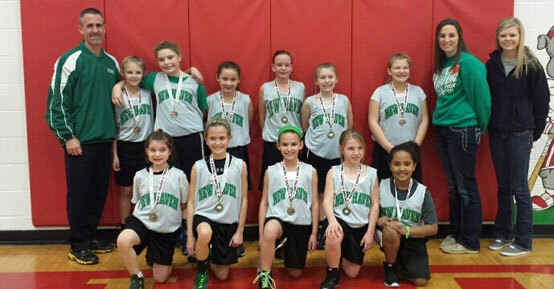 Congratulations to New Haven’s 4th Grade Girls Basketball Team on a thrilling and exiting first place finish.